This book gives "excerpt books" a bad name. At OnTheIssues, we do like excerpt books because we publish many of them, but we don't like THIS excerpt book. The excerpts are too short � they need context, not just a dozen words and a citation. For example, "Real reform isn't easy. But I also know this: If we don't fight, we can't win -- to the AFL-CIO convention" (p. 117). That's only 16 words � What type of reform? Fight against what? Win what? So much is left out that it's merely a headline, not really an excerpt at all. The brevity of this book makes it feel like the usual mainstream media out-of-context blurbs � meaningless because they are so short. Worse yet, the editor (he doesn't call himself "author") chooses to split up longer excerpts into several smaller blurbs. For example, we spotted the same citation ("Blog post, January 2014" � what blog? Her own? What context?) on page 22 in the "Financial Bailout" chapter; and on page 46 & 47 in the "American People" chapter. Might we see the fuller context by associating the items split up? An index would do that (this book lacks one), or a cross-reference to the other excerpts from the same citation (this book lacks that too). And speaking of a lack of explanation, the book also lacks any explanation of "insider terms" � they are just laid out "verbatim," presumably because the author was afraid to change one term in the original context [that is what editorial brackets are for!]. For example, "The CFPB and Warren had become a symbol" (p. 170) � what is CFPB? [it is the Consumer Finance Protection Bureau, proposed by Warren in 2007, which became a federal agency in 2011]. And another example, "an audience member� accused her of being a whore aligned with the OWS movement" (p. 178) � what is OWS [it is the Occupy Wall Street movement]. That is fine for pundits who know all those terms � but it feels like "Inside Baseball," where no one can follow the story in less than a week, to normal readers. Perhaps a glossary would be useful � there isn't one � or some sort of explanation � there isn't any � so the reader isn't left confused. All of our complaints are encapsulated all in one excerpt � an undated citation from "Indian Country Today" asserting that "if one has to research to try and ascertain if they are Native American, I would have great concerns� and wonder if that was a vehicle she would want to use to her benefit. If that is the case, shame on her" (p. 201). Well, IS that the case? The opinion of the writer in "Indian Country Today" is certainly relevant � the issue at the time was whether Warren had cited her Native American heritage to get an affirmative-action appointment at Harvard University � but the reader doesn't get to see the writer's opinion, or an explanation of the context of the dispute, or its outcome, or even what year the excerpt was written, so we might figure out if the outcome was still pending at that time, or what was going on. When obscure terms are used (like "CFPB" or "OWS"), explain them, provide background information about them, and provide a glossary and index (to avoid the "Inside Baseball" problem). We've been enforcing that list for five years now, and we reinforce our rules when we see awful books like this that have no rules whatsoever. 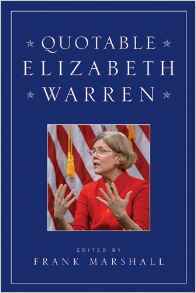 Yes, you can use this book to find out some tidbits about Warren � but it is by no means a good source! Elizabeth Warren: When risk & cost aren't disclosed, it's bad for our country. Elizabeth Warren: Middle class grows economy, not financial sector. Elizabeth Warren: I share the frustration of Occupy Wall Street. Elizabeth Warren: Give college students the same deal as corporations get. Elizabeth Warren: Invest now in 21st-century energy. Elizabeth Warren: Make trade deals transparent, even if that causes opposition. Elizabeth Warren: Trade deals are Christmas gifts for big corporations. Elizabeth Warren: OpEd: Bullies regulated companies into donation disclosure. Elizabeth Warren: Huge difference between sportsmen's guns and assault weapons. Elizabeth Warren: Insurance isn't on/off: real coverage vs. faux coverage. Elizabeth Warren: Obvious solution is universal single-payer healthcare. Elizabeth Warren: No Medicare vouchers and no privatization. Elizabeth Warren: Support the DREAM Act: let immigrants into army or college. Elizabeth Warren: Make it easier for workers to organize. Elizabeth Warren: Minimum wage workers haven't gotten a raise in 7 years. Elizabeth Warren: Supported Republicans for years prior to political career. Elizabeth Warren: Retirement benefits are about our values, not about math. Elizabeth Warren: Upgrade our aging roads, mass transit, & water lines. Elizabeth Warren: Strong sanctions against Iranian nukes, with other countries. Elizabeth Warren: Those in poverty fight for crumbs left over from the wealthy.